The image below was found and captured December 19, 2018. I was flattered to be called only a slightly mad Revisionist, and surprised to learn I had consulted the Jewish Tribune in connection with the Turgels’ claims that the lady had been hailed as the Bride of Belsen. 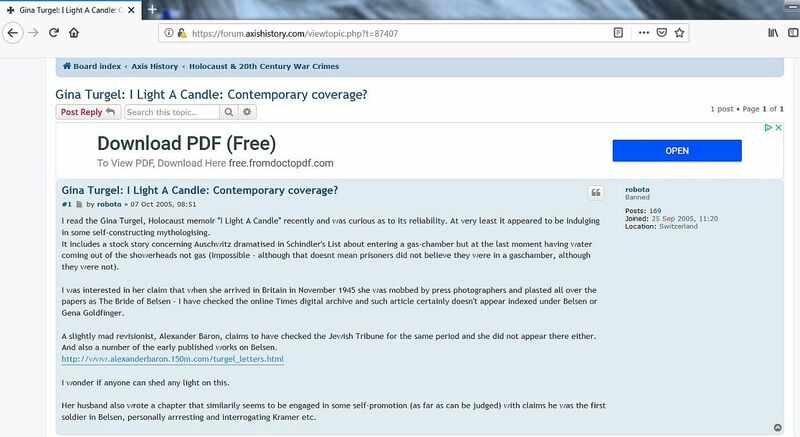 It was actually the Jewish Chronicle. The url given is now long obsolete, although it has been archived. Here is where it lives now. Said letter speaks for itself, and since Gena’s death in June 2018, it has spoken even louder. She outlived her slightly older husband by 23 years; as can be seen from the previous link, he was an even bigger liar than she was, but towards the end of her life she did her best to outshine him. Her obituaries claim she actually nursed Anne Frank in Belsen; these lies, which can be found all over the Internet, cannot be blamed on her ghost-writer Veronica Grewcock, or on her publisher. Rather they are symptomatic, not simply of Jews, or of women, but of human beings, period. The big difference is that thanks to the unremitting pressure and lies of Organised Jewry, challenging these at times easily provable lies is now a criminal offence in Germany and several other countries. And if they had their way, the same would be true here. That is why I am proud to call myself a Revisionist, and just as proud to be thought mad by the gullible goyim and at times the equally gullible non-goyim.